5:30 – 7:30 Open House at Our Office! 5:30 to 6:00 pm Educational Class on Skin Care & introducing our new Candessa line! $20 fee (can be applied towards product or treatment purchase excludes Botox). Limited seating available. Call to RSVP. 5:30 to 7:30 Botox performed by Dr.Kjar. Get $30 off your treatment (minimum of 20 units). Can be combined with Brilliant Distinctions: Must make appointment before 4/16. Call or come into our office. Jane Iredale Mineral Makeup consultations and applications. 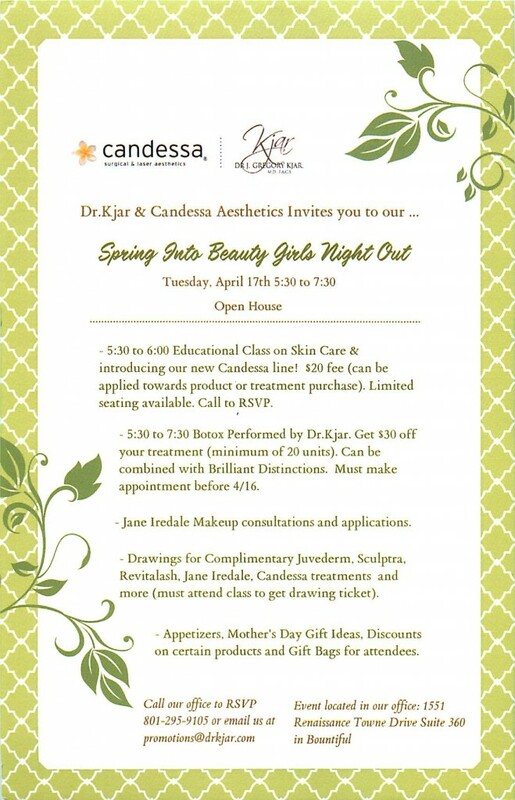 Drawings for Complimentary Juvederm, Sculptra, Revitalash, Jane Iredale, Candessa treatments and more (must attend class to get drawing ticket). Appetizers, Mother’s Day Gift Ideas, Discount on certain products (must attend to see which products – surprise) and gift bag for attendees.